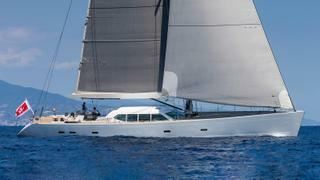 The 32 metre sailing superyacht Gliss, listed for sale by Y.CO, has been sold in an in-house deal. Launched in 2006 by Dutch yard Royal Huisman, Gliss is an all-aluminium yacht with naval architecture by Philippe Briand, built to Lloyd's class. In April 2017 she completed a seven-month winter refit at her home yard, which involved repainting the hull in a smart shade described as ‘whisper grey’. Her interior décor, courtesy of the late Pieter Beeldsnijder, retains its accommodation for seven guests in four cabins. These include a master suite, a double, twin and a single, all with Bluetooth stereo systems and en-suite shower facilities. Meanwhile, two further cabins allow for a staff of up to four crew. The deck saloon provides full protection and 360-degree visibility, while a family saloon below deck offers guests a snug space for relaxation and an entertainment centre including a large screen television. On the technical side, she is fitted with a Marten spars mast and boom and comes with a wardrobe of Doyle sails. Auxiliary power comes from a single Scania D12-65M engine, which provides a top speed of 13.5 knots, while the total fuel capacity of 8,500 litres allows for a maximum cruising range of 2,000 nautical miles at 10 knots. Gliss was asking €6,900,000 with VAT paid.